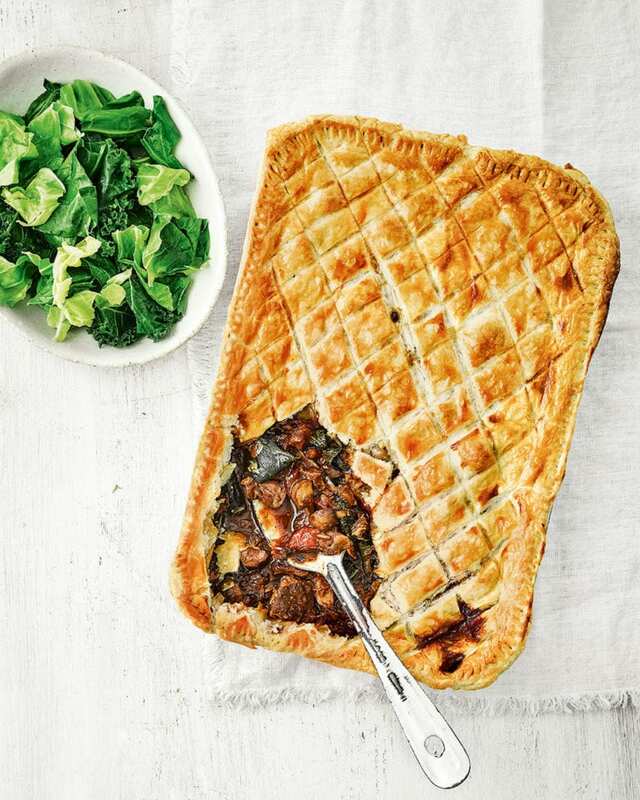 Use the other half of our beef shin and ale ragù in this rich peppered beef and mushroom pie. It makes comfort food heaven and is so easy to make once the ragù is made. Remove the ragù from the fridge 30 minutes before cooking, then put in the baking dish. Heat the oven to 200°C/180°C fan/gas 6. Heat the butter and oil in a large non-stick frying pan over a medium-high heat. Add the mushrooms and cook for 3-4 minutes, stirring now and then, until golden. Stir the mushrooms and black pepper into the ragù. Return the empty frying pan to a high heat, add a generous splash of freshly boiled water and cover with a lid or piece of thick foil until bubbling. Add the spring greens with a pinch of sea salt, re-cover and cook for 3-4 minutes until just wilted. Drain well in a colander, squeezing out excess liquid with a wooden spoon, then stir into the ragù. Unroll the pastry. Brush the edges of the baking dish with beaten egg, set the pastry over the top of the filling, then press down on the lip of the dish to seal. Brush with beaten egg then, using a small sharp knife, lightly score a criss-cross pattern on top (don’t cut all the way through). Bake for 25-30 minutes until golden and puffed. Serve with extra steamed greens, if you like.